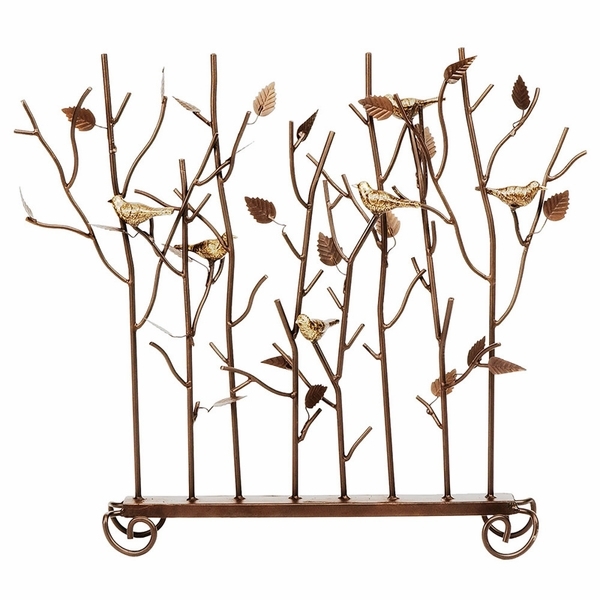 A delightful, nature-inspired fireplace screen crafted in wrought iron with Roman bronze finish. A summer screen is a great way to dress up your fireplace in the warm months when your fireplace is not being used. The rustic looking birds and twigs that adorn the leafy branches with accents of gold are a delight to look at and add beauty and interest to your fireplace surround. Even if you don't have a fireplace, it can be used anywhere you want a bit of whimsy. And because our screens are crafted in high quality materials, they can be used outdoors as well. Choose from three delightful designs. What are the specifications for this screen's height and width? What is its weight? Per the manufacturer, the height of this screen is approximately 26 inches, the width is 30 inches, and the depth is 5 inches. It weighs 17 pounds. If you want a little casual charm to your fireplace, and you enjoy nature theme, then you'll like this. It's not as "yellowish" bronze like the photo, more like a dark bronze, so minus 2 stars. Other than that, it's sturdy and fun to have. A little smaller than I thought but very nice. Fire place screen. It was very small! Was not attractive for my standard fire place. I was not pleased!